The clear, ventilated, plastic dome of the I.V. 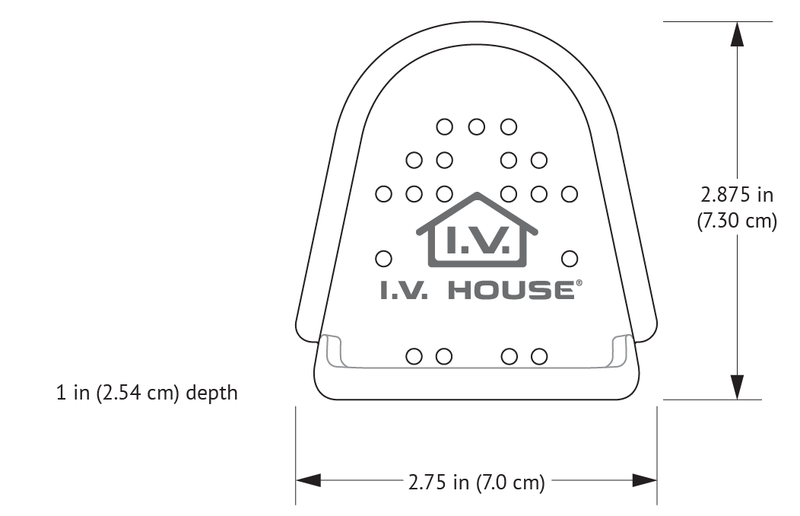 House UltraDome® shields, secures, and protects the IV catheter hub and loop of tubing while making it easier for nurses to visualize and inspect the IV insertion site without disturbing the patient. The padding on the flange is designed to be comfortable on the patient’s skin; extra padding on the outer rim of the I.V. House UltraDome Plus provides additional comfort for more active patients without the worry of bumps and snags that can lead to dislodgment. Soft foam-padded edges for comfort. Easy visibility and monitoring of IV insertion site to prevent injuries such as infiltration and extravasation. Eliminates exposed looping, a primary cause of dislodgment. Maximizes dwell time, minimizes the need for painful, traumatic restarts. Universal design fits hand, forearm, AC, foot/ankle, scalp or other peripheral IV. Designed for use with the I.V. House TLC® Splint. Protects, secures, and stabilizes the IV catheter and loop of tubing for pediatric patients. Allows easy access for routine assessments to extend dwell times.